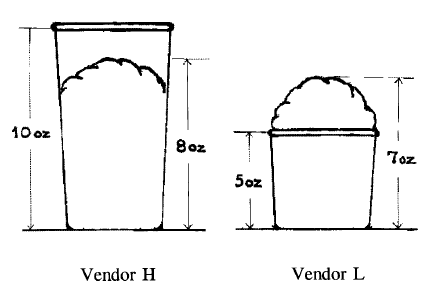 Seen side-by-side, though, the number of entries goes from non-evaluable to evaluable, because there are two compatible quantities to be compared. And, once the number of entries becomes evaluable, that facet swamps the importance of the torn cover. A 29/36 chance to win $2. A 7/36 chance to win $9. Similarly, which of these two ice creams do you think subjects in Hsee’s 1998 study preferred? From Hsee, © 1998 John Wiley & Sons, Ltd. P.S. : If you actually use this trick, I want to know what you bought.